How Much Is a Ticket For No Seat Belt In NY? A No Seat Belt Ticket in New York Cost How Much?! The simple answer is “Thousands of dollars.” Yep, you read that correctly. Pleading guilty to a New York State Vehicle and Traffic Law Section 1229 (VTL § 1129) No Seat Belt – Driver ticket can cost you thousands of dollars. True, the ticket itself carries no points, but what most drivers fail to realize is that a no seat belt ticket will trigger an auto insurance increase. Car insurance companies are based on an Insurance Demerit Point or Merit Rating Plan and convictions of certain NYS VTL infractions and violations means an auto insurance surcharge. Each insurance company determines the amount of the car insurance increase and the increase can be for a period of years. An auto insurance company can review a driver’s driving history for the past 36 months. If any merit system violations are found in the insured’s driving history, then the car insurance company can issue a surcharge (increase the insurance premium). How Much Is A No Seat Belt Ticket in NY For An Out-Of-State Driver? 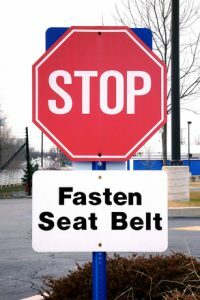 But, what if you are an out-of-state driver and received a no seat belt ticket in Westchester County, New York? Some motorist think that pleading guilty to a no seat belt ticket will not harm them since they have a driver license from another state. This is not true. An out of state driver is not immune from being caught in the large sticky web of auto insurance increase. There is an agreement, or interstate compact, between the states known as The Driver License Compact. You can think of this as the tattletale agreement. The states have agreed to communicate driving information with one another. Specifically a state will report to the home state of non-resident information like traffic violation convictions. The driver’s home state will then treat the convicted violation as if it happened in the home state and apply local laws to the out-of-state offense. For example, a licensed California driver is visit New York State and gets a ticket for not wearing a seat belt. The California driver pleads guilty and pays the fine. New York would then tell California that John Doe, a CA driver, was convicted of a no seat belt ticket in NY. California would treat the conviction as if the John Doe received and was convicted of the ticket in California. Then local California laws would be applied to the conviction – including an insurance increase. Sometimes going to court yourself to handle a ticket works out for the best, but by and large it pays to hire a traffic lawyer to resolve the ticket for you (no pun intended). The Claro Law Firm serves Westchester County, including Peekskill, New Rochelle, Mount Vernon and Rye. We have the best New York traffic attorneys who will consider the totality of your circumstances and will take into consideration latent consequences when resolving your traffic ticket. Call us now at 1-877-631-3539 for a free traffic consultation or contact us online before you make a costly mistake.